I soooooooo need one of these! It seems that right when I put my son down for a nap, that is when the guy, whose wife is running for mayor, decides to ring my doorbell... 3 TIMES!!!! Well, I can tell ya, she is NOT getting my vote! 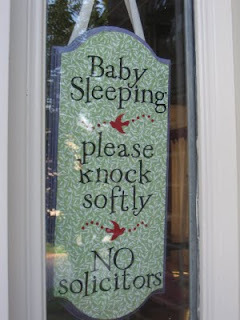 Natasha from Samster Mommy made this cute sign to tell people "Don't you dare wake my baby!" nicely. Find the tute HERE .